Below is a nominal roll of those who served in 46RM Commando. It is listed by order of surname. 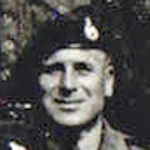 The names are primarily compiled from the booklet issued to Veterans in 1946 entitled "The Story of 46 Commando, Royal Marines, by Captain P.K.W. Johnson, RM". The author specifies the Nominal Roll is of those who served between 6th June 1944 and 8th May 1945. However additional names will be added in the future whenever an individual's Commando Service has been established. Marine Albert Anderson died during operations at Beuzeville, Normandy. 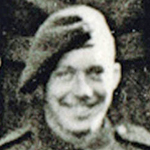 Corporal Joseph Atherton died during operations at Pont L'Eveque, Normandy. 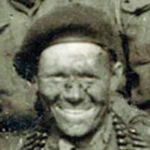 Marine William Atherton, 'B' troop, died during operations at Sallenelles, Normandy. 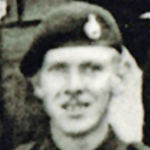 Corporal Jack Bailey, 'A' troop, died of wounds inflicted during operations at Sallenelles. 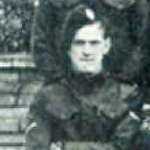 Sergeant William Begbie, 'Y' troop, died during operations at Rots and Le Hamel. Marine Verdun Bradley died during operations at the River Elbe crossing. 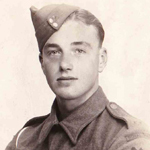 Corporal William Brooks, 'B' troop, died during operations at Rots and Le Hamel. Read more about BULLOCK, Geoffrey, H.
Quartermaster Sergeant George Buttery, 40 Commando RM, who had served as a Marine in 46RM Commando during WW2, was awarded the M.M., for gallant and distinguished services on the 6th November 1956 during Operation Musketeer, the Anglo-French Invasion of Port Said, Egypt. 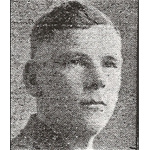 Troop Sergeant Major Reginald Buttress, 'A' troop, died during operations at Dozule on Hill 112. Marine Robert Casson died during operations on DDay at Normandy. His brother 14674155 Private Joseph Casson, aged 18, of the 9th Bn., Durham Light Infantry, was killed just 21days later on the 27 June 1944. They are buried alongside each other at Ryes War Cemetery. Marine Harry Charlwood, 'B' troop, was awarded the MM for his gallantry during the attack on Rots, Normandy. Having been wounded he was taken prisoner. 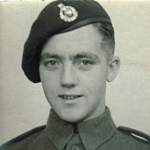 He was subsequently released when the prison camp was overrun by the 11th Armoured Division near Lubeck in May 1945. 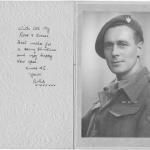 Corporal William Cook died during operations at the River Rhine crossing near Wesel. 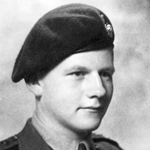 Sergeant Samuel Cooper was awarded the Military Medal for gallant and distinguished services while operating with the Army during the successful landings in Normandy. Marine Michael Coyle died during operations at Beuzeville, Normandy. Marine Arthur Cundall died during the period his Commando were engaged in operations at the River Aller near the village of Hademstorf. Marine George Davidson died during operations at Rots and Le Hamel. 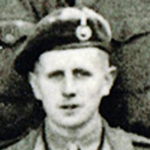 Troop Sergeant Major John Davies, 'Y' troop, died during the period his Commando were engaged in operations at the River Aller near Hademstorf. He received a posthumous MiD for "good services with the 21st Army Group." 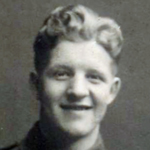 Sergeant Harry Denton, 'B' troop, died during operations at Pont L'Eveque, Normandy. 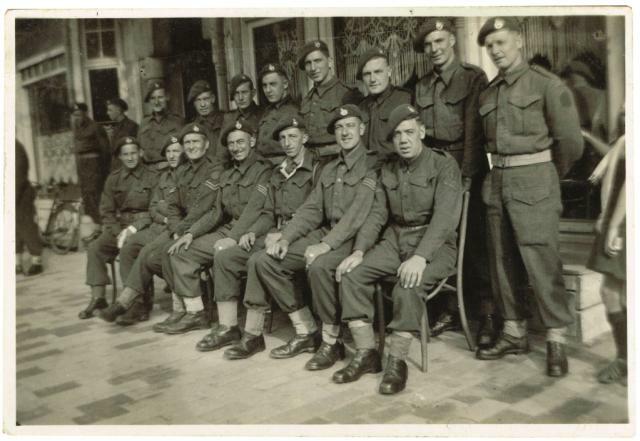 He also served for a period leading up to D Day on the staff of the Commando Mountain Warfare Training Centre at St. Ives. Marine Charles Dewberry, 'A' troop, was wounded during operations at Sallenelles. Mne. 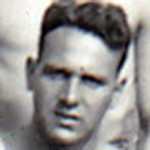 Dewberry who was from Gunton Road Upper Clapton, was found dead whilst taking a bath at the TOC H Club in Chichester. A post mortem came to the conclusion that his death was thought to be due to a fall, possibly as he got out of the bath. The Coroner recorded a verdit of Accidental Death. Marine Peter Donnelly died during the period his Commando were engaged in operations at the River Aller near the village of Hademstorf. 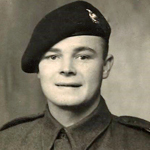 Marine Jack Downs, 'A' troop, died during operations at Rots and Le Hamel. 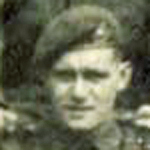 Marine Robert Facey died during operations at Sallenelles, Normandy. 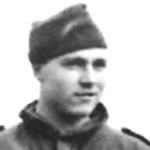 Marine John Fargher died during operations at Beuzeville, Normandy. Read more about FARGHER, John P.
Marine John Flood died during operations at the River Aller crossing. 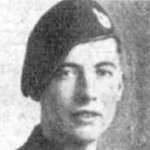 Marine George Fyvie, from Bucksburn, Scotland, died during operations at Beuzeville. His death was reported in a local newspaper at the time [view....]. Corporal Reuben Garlick, 'A' troop, died during operations at Rots and Le Hamel. The full circumstances of the death of Marine Alexander Harland are not known to this archive. Notes: The CWGC Grave Registration Report Form list him as killed in action. 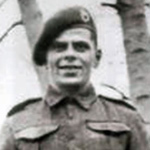 Corporal Ian Harris, born Hans Hajos, attached to No 10 (Inter Allied) Commando 3 troop ('X' troop), was awarded the MM in recognition of gallant and distinguished services in North West Europe. Marine James Hazell was awarded the MM for bravery, determination and great devotion to duty whilst serving with the Allied Armies in the assault over the Rhine. Sgt. 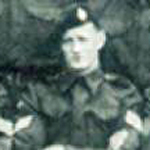 Hewett was a police intake into the Commando and served in 'S' troop. 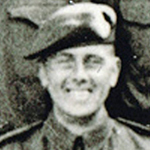 Sergeant Frederick Houghton died during operations at Beuzeville, Normandy. Marine William James died during operations at Beuzeville, Normandy. 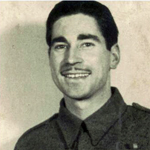 Lieutenant Anthony Jerram, 'A' troop, died during operations at Rots and Le Hamel. 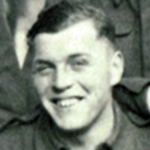 Lance Corporal Cyril Johnson, 'B' troop, died during operations at Rots and Le Hamel. Marine Henry Johnson, 'B' troop, died during operations at Rots and Le Hamel. Captain Philip Johnson was the author in 1946 of a small but most detailed and informative book issued to all who served in 46RM Commando titled The Story of 46 Commando Royal Marines. In the forward to the book Lt Col. Hardy gives thanks to Capt. Johnson, Capt. Buglear and Sgt. Barrow for their contribution in the preparation and distribution of the book. 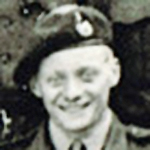 Philip Johnson had been with the Commando since its conversion from the 9th RM Bn. He received a MiD for "good services with the 21st army Group." Marine Ernest Jones died during operations at Rots and Le Hamel. 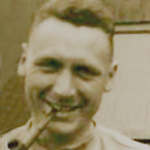 Marine Thomas Judd, 'B' troop, died during operations at Rots and Le Hamel. 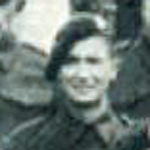 Corporal Robert Kimber died during operations at Hill 112 at Dozule, Normandy. Sergeant Thomas Ledger, 'A' troop, died during operations at Rots and Le Hamel. 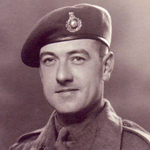 Major John Lee, MC, LLB, the Second-in-Command, died during operations at Beuzeville, Normandy. He was awarded the MC, in the rank of Acting Major, for "gallant and distinguished services while operating with the Army during the successful landings in Normandy." Troop Sergeant Major William Leeming died during operations at Rots and Le Hamel. Marine Charles Lunn, 'X' troop, died during operations at Beuzeville, Normandy. 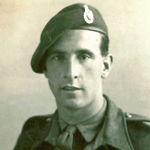 Acting Temporary Company Sergeant Major Herbert Mallorie was awarded the MM for gallant and distinguished services in North West Europe. London Gazettes Supp. 37464, page 909. National Archives file WO 373/47/99. Sergeant Peter McCarthy was awarded the MM in recognition of gallant and distinguished services in the combined attack on Dieppe . He is also named as serving at the CMWTC and attached at some stage to 46RM Commando. .
 London Gazettes Supp. 35729, page 4328. Nom. Roll for 46RM Cdo 6th Jun 44 -May45. Lance Corporal Richard McCarthy was a medic attached to 46 RM Commando and was awarded the MM for his gallantry during operations at Rots and Le Hamel. 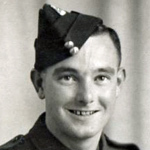 Corporal Robert McFall, 'B' troop, died during operations at Rots and Le Hamel. 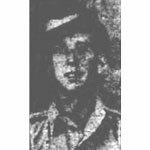 Marine John Miller, 'X' troop, died of wounds inflicted on the 20th August during operations at Hill 112, Dozule, Normandy. 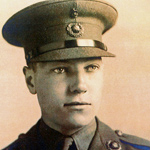 Lance Corporal Sidney Moody, 'X' troop, died during operations at the River Elbe crossing. Marine Kenneth Musgrave, 'A' troop, died during operations at Rots and Le Hamel. Marine John Parker died during the period his Commando were engaged in operations at the River Aller near the village of Hademstorf. 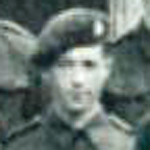 Captain Barry Pierce, 'Y' troop, died during operations at the River Aller in the vicinity of the village of Hademstorf. A footnote on the headstone of his grave reads "The first British soldier over the Rhine. 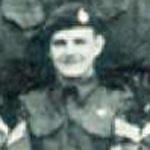 46RM Commando 'Y' troop. March 23 1945"
The book A Plain Russet-Coated Captain by Capt John Day 45RM Cdo. CVA Gallery image of his headstone. 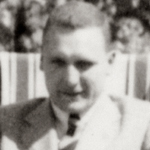 Marine James Pizey died during operations at Beuzeville. Marine John Ponsford died during operations at Beuzeville, Normandy. 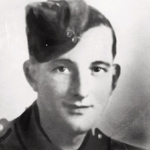 Marine William Rennie was awarded the MM for distinguished service whilst attached to the Allied Armies in the invasion operations in North West Europe. Sergeant Harry Robertson, 'S' troop, died during operations at Rots and Le Hamel. 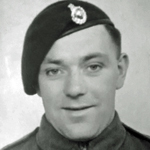 Corporal Albert Rogers, 'A' troop, died during operations at Rots and Le Hamel. 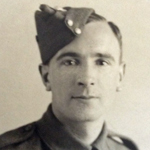 Sergeant Edward Rowe died during operations at Rots and Le Hamel. 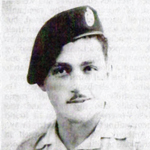 Herbert Sachs was of the Jewish Faith and served under an alias of Herbert Seymour in 3 troop, also known as 'X' troop, of the inter allied commando. Corporal James Scullion, 'Z' troop, was awarded the MM for bravery and great devotion to duty whilst operating with the Allied Armies in North-West Europe. London Gazettes Supp. 37127, page 3090. 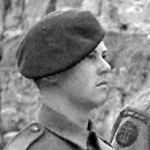 Captain John Simpson, RE, was attached to 46 RM Commando at the time of his death which is recorded on a document in our gallery relating to the Commando Mountain Warfare Training Centre at St Ives as "died on active service." 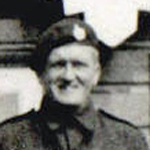 Sergeant Norman Skeath received a MiD for good services with the 21st Army Group. Marine Joseph Smallman died during operations at Beuzeville, Normandy. 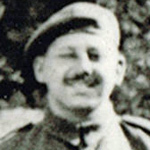 Sergeant James Smith, 'B' troop, died during operations at Rots and Le Hamel. 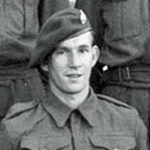 Eric Taylor enlisted into the Royal Marines in 1939. After his training he served on HMS Suffolk from the 3rd April 1940 to the 3rd January 1941. After this he served on board HMS Malaya from the 6th August 1941 to the 13th December 1943. 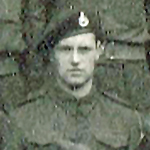 He served in 46RM Commando from the 15th January 1944 until the 20th July 1945. 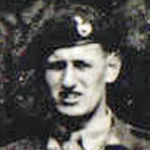 Captain Bryan Teague, 'Z' troop, died during operations at Sallenelles, Normandy. He had previously received a C.-in C.'s certificate. Marine Walter Tear received a MiD for gallant and distinguished service in NW Europe. Marine Jack Tomkins died in the UK. The exact circumstances of his death are not known. At the time of his death the Commando were engaged in cliff assault and seaborne landing exercises in preparation for DDay. Marine Thomas Vardy MM, died during operations at the River Aller crossing. Tom Vardy joined the Royal Marines on the 22nd May 1941 being attached to the Royal Marines Reserve Depot until 8th July 1941. From 9th July 1941 to the 2nd November 1941 he was posted Plymouth Division. 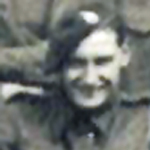 On the 3rd November 1941 he was posted to the 9th RM Battalion, and from there on the 1st August 1943 he joined 46RM Commando. Marine Alexander Wheeler, 'A' troop, died during operations at Rots and Le Hamel. Corporal James Whitaker, 'S' troop, died during operations at Rots and Le Hamel. +. 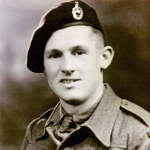 Marine Harry Wilson died during operations at Troarn, Normandy. 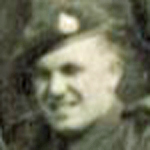 Lieutenant George Woollam died in an accident whilst serving at the Commando Basic Training Centre. The death certificate states he died of a fractured skull at the North British Aluminium Company's Works. 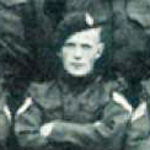 He was in 'A' troop of the Commando in May 1944. He was from Tunstall and is remembered on their War Memorial. He is buried in Fort William (Glen Nevis) Cemetery.